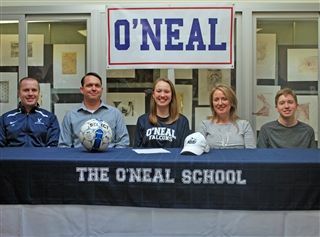 Surrounded by friends and family, O’Neal senior Chloe Hoffman has officially committed to Nova Southeastern University to play for the Sharks’ women’s soccer team. 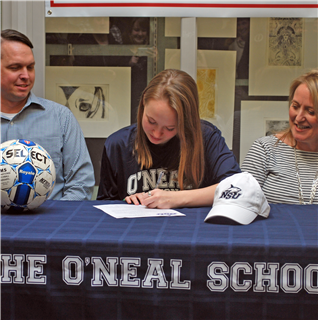 Hoffman, a two sport athlete at The O’Neal School, has been a three year starter for the Falcons varsity girls’ soccer team and has also been a member of The O’Neal School’s State Championship winning swim team in 2015. 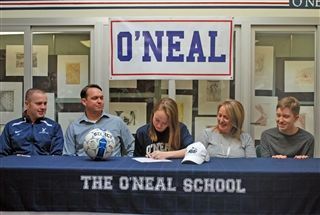 Outside of O’Neal, Hoffman has played with Triangle United Soccer Association, out of Chapel Hill, NC for four years and was also a member of the North Carolina ODP select team from 2011 to 2013.